Chiara Ribera d'Alcala. Studied at the British School of Osteopathy. Advanced study at the Molinari Institute. Fluent in English, Italian and French. 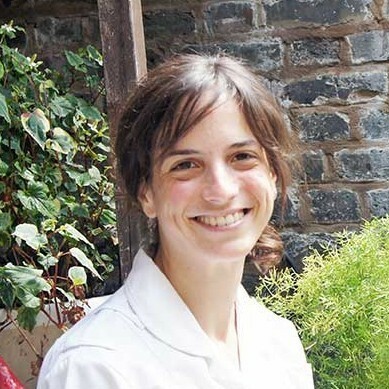 Chiara Ribera d’Alcala – Women’s health osteopath. Available on Mondays. Holding a Masters of Osteopathy from the British School of Osteopathy, Chiara Ribera’s approach to osteopathic treatment is individualistic, as she strives to familiarise herself with each patient as a unique person, taking into consideration lifestyle, background, occupation and pre-existing injuries to create a treatment plan catering to each person as a whole. Chiara has a particular passion for working with women – specifically, managing complaints relating to the hormonal cycle, changes during pregnancy, and ageing – and has attended further post-graduate training for Women’s Health at Molinari Institute of Health. She is also completing her post-graduate diploma in paediatric osteopathy at the Osteopathic Centre for Children. She initially developed an interest in the functioning of the human body and its injuries during her previous career as a contemporary dancer. She is fascinated by the functionality of the human body – its ability to adapt and self heal – and how osteopathy can facilitate this process. In addition to English, Chiara is also fluent in French and Italian.